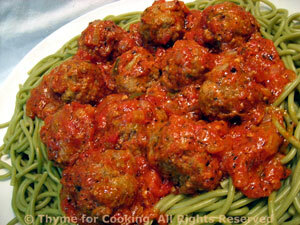 Spaghetti with Pesto Meatballs, Thyme for Cooking easy pastas. Add beef, mix well (use your hands). Form into meatballs, about 1 1/2" (5cm) in diameter. Add tomatoes, sauce and herbs. Heat to simmering. Drop the meatballs in carefully, trying to keep them separate. Cover and simmer until meatballs are done, about 15 minutes. Stir once or twice. Spoon meatballs and sauce over the top, remove bay leaf, sprinkle with Parmesan and serve.